In the review I noted several weaknesses of the IPad app that I thought I might be able to address with a MindManager Add-in (Omni2Map). As a Windows user, I particularly I wanted to avoid having all my plans stranded in my IPad. I also was interested in aiding my (occasional) weekly reviews with Next Action Analysis. Omni2Map will import your OmniFocus data into a MindManager map and mark up your projects and tasks with due dates, contexts, etc. More information and screen shots are located on the Omni2Map page on the ActivityOwner.com wiki where you can download the latest version. It is only compiled for MindManager 8 and 9 at the moment. 1. Import the actions in the OmniFocus Inbox – I usually have a number of unprocessed actions lurking in there which could get overlooked. 2. Import the notes associated with a task into the notes of the branch. I would find this essential. Having seen what you have achieved in this beta my imagination is getting quite fired up and I’d say a long-term objective might be two-way synchronisation with ‘Map2Omni’ exporting an updated version of contents.xml… but I’m not sure how the syncing back into OmniFocus would work. However, is it possible to highlight or export changes made to the mindmap since import so that one can easily manually update OmniFocus? Thanks Richard — I’m just uploaded v1.0.042. It adds request 1 & 2. Thanks for the bug catch on #1. It was analogous to the earlier mistake I made on projects that don’t live in folders. The xml representation of a note is much more complex than the other fields so I’m not sure how well #2 will work. It will need some real world testing. #3 should be possible but it will take some coding I don’t have time for today. I will put it on my someday list. Two-way syncronization would be pretty complex and risky an not something I can take on. Keeping track of map changes is also a pretty tall order. ResultsManager has some mechanism to do it with dashboards, but its magic. I could envision an algorithm, but its a lot of work for a user base of 1 :-). Installed v1.0.045 and have now got Inbox actions and Notes – very, very useful. I will continue to test the notes import but basic notes work well so far. I tried installing the 2012 version, but it will not accept the add-in and disables it. Any ideas how I can make it accept it? Sorry Paul — We keep our prices down by dispensing with things like testing :-). I can’t replicate this problem though. I just re-installed and it came in fine. I would try uninstalling, confirming that you have Mindmanager fully closed (check processes on task manager) and re-install. Sometime re-enabling add-in can help. Let me know what you find. I have also installed 1.0.045 and can import inbox and area-related projects. I noticed that for OmniFocus projects that have action items flagged as “Sequential”, ResultsManager is not adding a “list” flag to the project title. In other words, if i have a sequential list of tasks in an OmniFocus project, ResultsManager must be able to identify which is the next action for NAA. Otherwise, all actions imported within the project are treated as “parallel” in ResultsManager. Also, I noticed that due dates on tasks do not appear to be migrating properly from OmniFocus to ResultsManager. I’ll continue to test this add-in — it appears to be quite useful! Thanks Adam — I will put these on my “sequential” to do list for omnifocus. Unfortunately a stack of other year end stuff higher up in the “list” right now :-). Thanks AO — will continue to work with the add-in and suggest useful updates. Happy New Year! 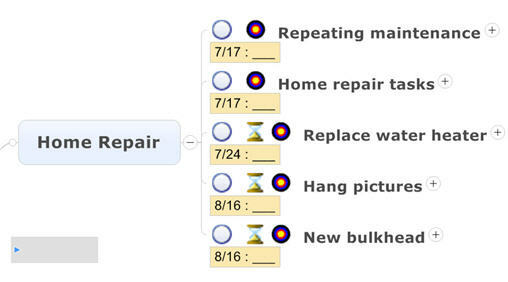 Adam — I added “list” functionality for you in latest version (1.0.051). AO — do you have a functional version of Omni2Map for MM2012? The Beta version is not downloading from your site. Thanks Adam — Sorry about that. I had a typo in the download link. It is fixed now. I tried to get the contentsfile from the omnifocus. I logged into their omnifocus sync server. i get the option to download a backup of my data . which gives me a .tar file whic contains no content.xml. Hi Rene — Here is the sequence of things you need to do. 1. go to https://www.omnigroup.com/sync/ and set up syncing and then download the omnisyncserver.tar file as you have. 4. Sort that folder by size and you will find the biggest zip file is the one that has the contents.xml file in it. 5. Extract that to disk and then run the omni2map add in and point to it. I’d love to get this to work, but I swear I’ve repeatedly followed the steps and am where rene corjanus was on March 18 @ 6:54pm. I’m usually NOT so dense. But I get a 4.8MB OmniFocus.ofocus document that opens as a different instance (a duplicate) of my OmniFocus that I have open. I can’t look for the content file or move on from there. If you have any time to assist, that would be greatly appreciated. Hi Cindy — I am happy to try to help. Are you using a Mac and it is actually opening the file OmniFocus? That is the only way I can see you opening a duplicate. The mac os is probably smart enough to launch you into omnifocus rather than expose you to all the underlying configuration files in that folder. If you are on a mac, can you access the file from windows VM? The Omni2Map add-in will only work on a windows version of MindManager so I’m guessing that if you are on a Mac, you have some type of windows functionality as well. Thank you for your quick response. I thought it would work with MindManager on both Mac & Windows. So, yes, I was opening on a Mac. Now, at home on my PC, I was able to get the contents.xml file successfully extracted. I was able to get the Omni2Map add-in installed where I see the tab/options from within MM 8 on Windows. I am exploring the cost to upgrade my V8 MindManager to MM 2012. Maybe once I do that all will be well? Thanks for your assistance and for what sounds like a program I’d really like to use! Hi Cindy — Thanks — it would be great to work on inproving the program with a power user. I need to be running it more myself as (at best) I’ve been just using my ipad and not really looking at overall project list in the strategic way that Omni2map allows. I compiled a new version (52) that traps the error above, but that isn’t really going to help. It seems the problem is that MindManager is having trouble opening your contents.xml file. Can you try manually browsing to it and opening it manually in MindManager itself. MindMananger can open both .mmap files and .xml files. That might help clarify what is going wrong. Sorry — I don’t think I compiled it for that version. When I was working on it I focused on just updating the v9 version as that is what other folks were using. I will recompile for version 10 shortly and post when it is uploaded. Thanks AO. That would be great. Looking forward to using this great tool soon. Give it another try now. I recompiled the 2012 build to latest version (1.052). Am I doing something wrong… any ideas? The versions you mention look right. One is my version one is what the software maintains. Can you try upgrading to 10.0.493 or later? That is what is installed on my system and it may be related to that. I just tested installing and it worked OK.
Not sure what this is all about and unsure what to do next as all I can do is close MM to escape from it. Partial maps do appear on various sheets but the whole thing is frozen up. The content file is about 410kb and consist of various folders, contexts, and tasks. Hi AO and thanks. Tried to post earlier, but it doesnt seem to be showing up here. The addin seems to activate fine now, with an upgrade to MM 10.2.209. Any further ideas or help you can offer? Hi Paul – Maybe it must be something unique about your contents.xml compared with what I have tested. Can you tell what entry it is getting stuck on? If you can send your contents.xml file to me at info@activityowner.com I can try to debug what the hang up is. Alternatively I can compile a version that pops up a message just before each time that line of code is executed to try to isolate the part it is getting stuck on. I have macs only. Is this possible for me? 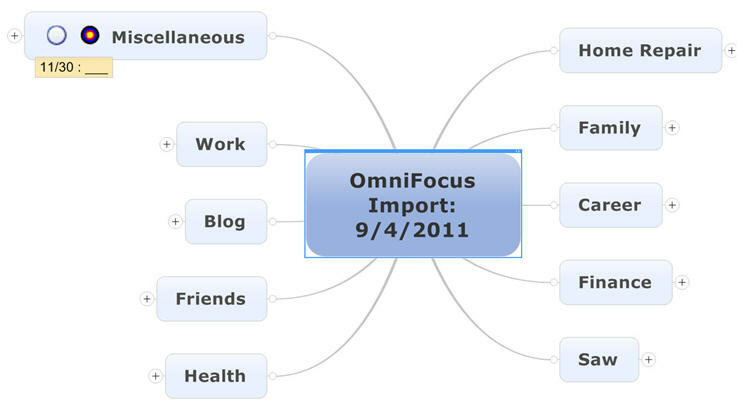 I want to set up this mind map to function just like omni focus so I don’t have to use omni focus anymore. It seems almost redundant. Omni focus doesn’t allow projects within projects, or multiple contexts which i would like to. If I can upload my very crowded omnifocus data I can edit the map to function as I want… I hope. You really need to be using PC to leverage Mindjet. Their mac versions tend to be behind I think and the ResultsManager add-in only works on PC. Are you still there? is there an update to Omni2Map to use the latest version of MM?